New this year at Moulin Rouge is Road Trip: Sounds of the Cities. The show features songs that are stereotypical for certain cities in the USA. This was their Vegas set. New York has songs that were famous on Broadway. Miami had songs from Miami Sound Machine and Pit Bull. The song was decent, but the theme felt forced. I am sure with a little tweaking it could be a great show. Muttalica is back at Country Junction. The show begins with an obstacle race between two dogs. 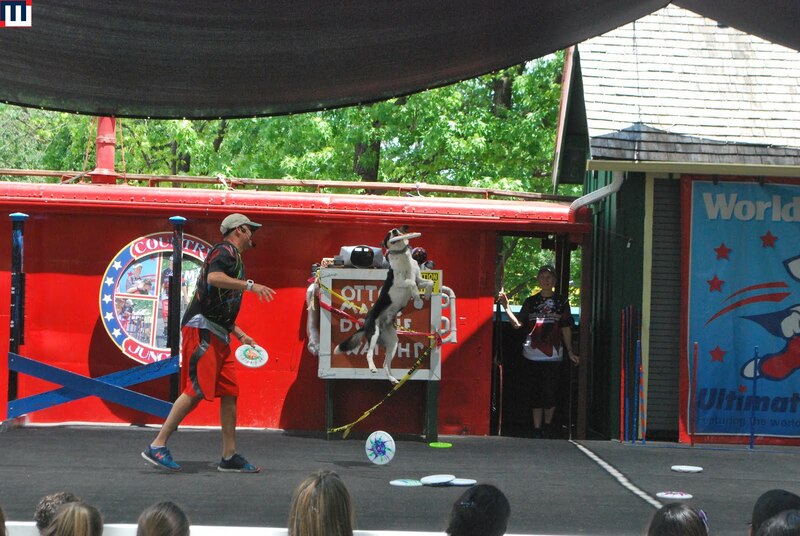 The frisbee catching dogs are back and they can really jump high. 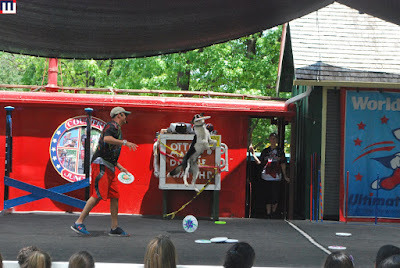 The finale of the show is a height jumping dog and her can really soar. New for the kids this year is Team Charlie Brown in the Peanuts Showplace. The younger kids seemed to enjoy the show, but the parents were all really suffering through it. They have two shows this year at the Showplace. The second is Sally's Rockin' Dance Party. This is more of an interactive show for the kids. They are invited up on the stage and get to dance with Sally. Moulin Rouge is home to two shows again this year - the other being the returning favorite Don't Stop Believin' which features 80s music. They've update the signs during their "we're not going to take it' song set. New this year is their Vogue sequence which feature some major dresses for the ladies. Of course you can't do a Vogue set without doing the song Vogue. The show ends with a medley of Journey songs. It is a really good show.